Panache Vintage & Finer Consignment is the place to shop luxury Women’s Consignment Clothing! Anyone who has ever been inside Panache Vintage & Finer Consignment can tell you, this isn’t just consignment, it’s luxury resale of women’s consignment clothing! At Panache Vintage & Finer Consignment you can find like-new designer clothing at up to 70% off retail. All of our women’s consignment clothing, shoes, jewelry, and accessories are “gently-used,” and actually like-new. We want to bring Rochester, NY pieces that are in great shape, on-trend, or classic and timeless. Being in the heart of Rochester, NY, Panache Vintage & Finer Consignment knows that they are in the center of a fashion meccas. Focusing on offering fashionistas “gently-used,” women’s consignment clothing, shoes, boots, handbags, jewelry, and other accessories, Panache Vintage & Finer Consignment has risen to the top of the consignment industry in Rochester, NY. Panache Vintage & Finer Consignment will always bring your you fresh, modern styles in designer clothing and accessories – at great prices. On top of that, you’re also being green and kind to the environment by selling your clothing and buying some like-new pieces for yourself. We know you love designer brands, but why pay designer prices? 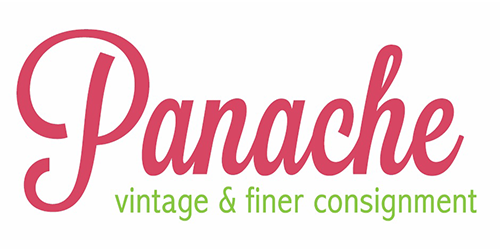 Panache Vintage & Finer Consignment in Rochester, NY specializes in women’s consignment clothing, giving you more ooolahlah for your mooolahlah! Many women’s consignment stores can be hit or miss; the price may be right, but the quality or selection just doesn’t cut it. Not here. Panache Vintage & Finer Consignment takes women’s consignment clothing to the next level, boasting designer labels and only high-quality garments and accessories. Looking for a one of a kind piece to tie your outfit together? Panache Vintage & Finer Consignment is Rochester, NY leading women’s consignment clothing boutique! Panache Vintage & Finer Consignment Offer an ever changing selection of women’s consignment clothing! Is your closet overflowing and yet you still have nothing to wear? Panache Vintage & Finer Consignment is the place to recycle your designer, better department, and specialty store used women’s clothes. And now that you’ve made all that space in your closet, isn’t it time for something new? Luckily, you know you don’t need to spend an arm and a leg to get your hands on the fashion you want. Stay up to date on the latest trends at unbelievably low prices with Panache Vintage & Finer Consignment! Browse our Panache Consignment Season page to ensure that your items are ready for consignment! Follow us on Instagram for our latest arrivals!